The VXi Passport 21G binaural single-wire headset incorporates the proven sound quality and durability of the Passport 20, with a lightweight design that is ideal for all-day use. The Passport 21G is designed to work with VXI-G or Jabra/GN Netcom Lower QD Cords. 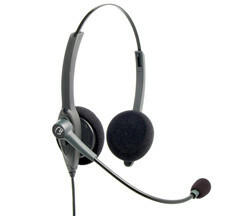 The Passport 21 single-wire binaural headset is designed for contact center and office professionals. Passport headsets are used in many leading companies worldwide that depend on them for clear and consistent communications. Designed to last, the Passport 21 headset can withstand the constant demands of all-day use in contact centers. Compatible with VXi-G and Jabra/GN Netcom amplifiers and direct connect cords.